Written by: Priya Potapragada on August 14, 2017. The tropical forests, arid deserts, rugged Himalayan mountains, and rolling plains along the Ganges help support India’s diverse ecosystem. With only 2.4% of the Earth’s land area, India is home to 8% of the world’s recorded animal species – 89,000 to be more exact. Unfortunately, rich biodiversity coupled with the growing demand for wildlife products has heightened illegal trafficking of various animals across the region. The Wildlife Trust of India (WTI) strives to conserve India’s ecosystem through advocacy aimed at strengthening legislation, their efforts to enhance community involvement in environmental sustainability, and protection of the country’s most endangered species: Indian foxes, pangolins, and elephants. The Indian fox, also known as the Bengal fox, and the pangolin are two species particularly threatened in India. In response to the unfortunately lucrative poaching business, the WTI strives to combat illegal wildlife trafficking with increased anti-poaching patrol, forest enforcement funds, and nationwide educational and awareness campaigns to advocate for the protection and conservation of the two endangered species. The Indian fox population, native to the semi-arid grasslands of India, is continuously declining as a result of human expansion, disease, and poaching. Typically hunted for their fur, skin, and teeth, they are trapped using pieces of meat placed inside chemical-laced traps. With the support of donor funds via CAF America, the WTI launched a Rapid Action Project (RAP) to investigate the illegal Indian fox trade and identify the perpetrators. WTI successfully discovered the use of traps in local sugarcane fields and utilized funds to support anti-poaching enforcement. Pangolins, scale-plated nocturnal animals endemic to Africa and Central Asia, are the most trafficked mammals in the world, with sales estimated to make up 20% of the wildlife black market. The pangolin population plays a crucial role in sustaining an already fragile Indian ecosystem by improving soil quality and providing natural pest control for the region. Pangolin scales and meat are considered commodities, especially in the Chinese medicinal industry. As a result, pangolin scales sell for upwards of $3,000 per kilogram resulting in hundreds of thousands of pangolins being poached annually. A survey conducted by WTI highlighted the rampant trade of pangolins in India and the need for educational programs to protect these endangered animals. Through the support of donors and various NGOs such as the Wildlife Protection Society of India (WPSI), WTI aims to launch a nationwide campaign advocating for the protection of pangolins and increased funding to law enforcement officials protecting the species. In addition to wildlife trafficking, increasing human populations have significantly threatened wild elephants’ habitat areas in the country. WTI aims to save these large migratory animals by expanding elephant corridors and launching an awareness campaign to promote the importance of reducing human-elephant contact. Indian elephants, large herbivorous mammals, spend 75 percent of their time eating and therefore needing to roam vast areas of land to satisfy their robust appetites. Unfortunately, expanding human populations have forced elephants to migrate through villages, claiming the lives of many humans and elephants each year. 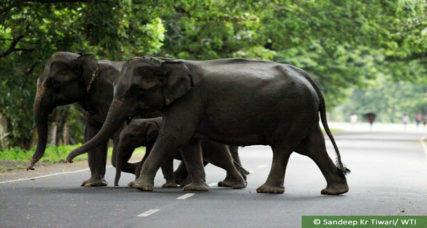 To combat this growing issue, WTI aims to expand elephant corridors throughout India. These natural pathways connecting large forested regions allow elephants and other animals to migrate freely without human contact. Through partnerships with local governments and other environmental NGOs, WTI hopes to launch Gaj Yatra, a national event to promote better understanding of the need for elephant corridors particularly affected by elephant migration. Though WTI has already secured five elephant corridors, additional funding is needed to expand this network and ensure sustainable habitats for elephants. Though efforts undertaken by the Wildlife Trust of India have been successful to date, the need for increased financial support is imperative to successfully protect and conserve endangered mammals like Indian foxes, pangolins, and elephants. By expanding research and data collection, funding anti-poaching efforts, and educating local communities about the importance of conservation, collectively we can ensure India’s biodiversity.